Adding tomatoes to that sandwich at lunch or to your salad at dinner is a great idea when it comes to protecting your good health. This is because tomatoes contain a rare red pigment called lycopene. Lycopene acts as an antioxidant by neutralizing free radicals. 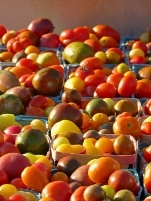 Studies have suggested that lycopene may have twice the cancer-fighting power of beta-carotene. And for men, lycopene seems to concentrate in the prostate, protecting this gland from cancerous tumor growth. These days, when you go to buy tomatoes at the grocery store, you’re likely to see more than just the humble red tomato. There are also yellow, tangerine and even purple varieties available for purchase. But are these colorful varieties just as nutritious as their red cousins? According to recent research, tomatoes don’t have to be a deep red color to be a big source of healthful nutrients. It turns out that the lycopene from orange- and tangerine-colored tomatoes may actually be better absorbed than the lycopene from red tomatoes. It all comes down to the fact that there are two different forms of lycopene: trans-lycopene (found in red tomatoes), and tetra-cis-lycopene (found in orange and yellow tomatoes). Researchers in Portugal recently compared various tomato varieties and their key bioactive components.